Invocation of jurisdiction under section 263 by successor commissioner on same issue having already been examined by predecessor Commissioner is invalid. The issue and the error as per the learned Commissioner which had occurred in the order of the assessing officer which required initiation of review proceedings in the present case was that the assessee had wrongly claimed and been allowed deduction under section 54F of the Act from the long-term capital gain earned by it on account of construction of house undertaken by it to the extent of Rs. 15,06,457. The reasoning being that the deduction on account of purchase of land and construction undertaken on the said land, under sections 54 and 54F, had been claimed and been allowed to the assessee in the preceding assessment year, i.e., assessment year 2004-05. The contention of the Revenue is that once the deduction under sections 54 and 54F of the Act has been claimed on account of house constructed against capital gains earned during the year, any surplus remaining there­from cannot be carried over to the next year and claimed as deduction from capital gain earned in the succeeding year. Clearly and undisputedly this issue was examined by the Commissioner in proceeding initiated under section 263 of the Act vide his notice dated 14-12-2007 and due reply filed by the assessee, after considering which and after being satisfied by which the proceedings were dropped. The present proceeding having been initiated on the identical issue are clearly unsustainable in law since it simply tantamounts to review of the order of the Commissioner and not of the assessing officer. The co-ordinate Bench of the Income Tax Appellate Tribunal in the case of Satya Prakash Gupta (supra) has in identical circumstances held that the successor Commissioner becomes functus officio in this regard after the exercise conducted by the predecessor Commissioner. Therefore, we have no hesitation in holding that the order passed under section 263 is not sustainable on this ground alone. A bare reading of sections 54 and 54F of the Act nowhere states that the surplus remaining after claiming deduction under section 54/54F on account of construction of house property undertaken in a year, would not be allowed set off against long-term capital gain earned in the succeeding year. There is no such specific bar provided in the section. The learned Departmental Representative also agreed to this. Therefore, as long as the conditions specified under section 54F are fulfilled, the interpretation and understanding of section as taken by the assessee and also by the earlier Commissioner cannot be said to be perverse and grossly against law. Both the appeals have been filed by the same assessee. While the appeal in I.T.A. No. 667/Chd/2010 is against the order of the Commissioner-III, Ludhiana dated 23-3-2010 passed under section 263 of the Income Tax Act, 1961 (in short “the Act”) relating to the assessment year 2005-06, the appeal in I.T.A. No. 954/Chd/2016 is against the order passed by the Commissioner levying penalty under section 271(1)(c) on account of addition made in the order passed under section 263 of the Act. 2. Since both the appeals are interconnected, they were heard together and are being decided by this common order. We shall be first taking up the appeal filed by the assessee against the order passed by the Commissioner under section 263 of the Act in I.T.A. No. 667/Chd/2010. 3. At the outset, it may be pointed out that the present appeal was dismissed in limine for want of prosecution vide order dated 10-6-2013 but was thereafter called in consequence to a miscellaneous application filed by the assessee, vide order of the Income Tax Appellate Tribunal dated 21-10-2016 in M.A. No. 11/2016. In pursuance of the said order, the case was fixed for hearing before us. The deduction of Rs. 15,06,457 claimed under section 54F in this year pertains to the long-term capital gains transaction conducted in the assessment year 2004-05. The original assets were transferred in the assessment year 2004-05. The cost of investments in the new assets in the assessment year 2004-05 was already more than the capital gains arising on account of original assets of the assessment year 2004-05. The excess investments made in the new asset in the assessment year 2004-05 could not he carried forward (like the unabsorbed business loss/depreciation) to the next year. The sum of Rs. 15,06,457 is in regard to the new asset of the assessment year 2004-05 where the investments were already more than the capital gains arising out of original assets in the assessment year 2004-05. The deduction of Rs. 75,06,457 made in the assessment year 2005-06 is against other assets (not the original assets of the assessment year 2004-05) which were sold in this year and that too is not against ‘net consideration’ but against capital gains arrived at after adjustments of indexed costs. The deduction of Rs. 15,06,457 against the long-term capital gains of this year is not as per section 54F of the Act. The assessing officer has erred in allowing deduction of Rs. 15,06,457 while computing the long-term capital gains for this assessment year. It is also not apparent whether in regard to the expenditure of Rs. 3.02,590 incurred for 2005-06, the provisions of section 54F(4) were satisfied/applicable and whether the new asset was constructed within three years. There appears to be under assessment of long-term capital gains/income. 5. The assessee responded by filing a reply to the aforesaid notice stating that it had not violated any of the conditions/requirements provided under section 54F by virtue of claiming deduction under the said section amount­ing to Rs. 15,06,457 and, therefore, challenged the power exercised by the Commissioner under section 263 of the Act. The learned Commissioner did not find any merit in the contention of the assessee. The learned Commissioner thereafter held that the deduction claimed under section 54F of Rs. 15,06,457 was not as per law and directed the assessing officer to recompute the income by deny­ing the said deduction. “(i) Copy of the notice dated 14-12-2007 issued by the Commissioner-III, Ludhiana placed at paper book page No. 1. ‘On going through your assessment records for the assessment year 2005-06, it is seen that you have claimed exemption of Rs. 15,06,457 under section 54F out of long-term capital gain of Rs. 35,13,572. The sum of Rs. 15,06,457 is pertaining to transaction of long-term capital gain of the previous year relating to the assessment year 2004-05. Thus a sum of Rs. 15,06,457 is in regard to the original assets which were sold during the assessment year 2004-05 and in that assessment year the investments already exceeded the capital gain arising out of sale of original assets. The deduction of Rs. 15,06,457 claimed for the assessment year 2005-06 is against the other original assets which were sold in the assessment year 2005-06. The deduction of Rs. 15,06,457 claimed under section 54F in the return of income for the assessment year 2005-06 is not correct on the facts and law. Subject : Reply to your notice under sections 263(1) of the Income Tax Act, 1961 in the case of Sr. Baljit Singh Prop. M/s. Ryait Enter­prises, R/o 197-198-F, Shaheed Bhagat Singh Nagar, Pakhowal Road, Ludhiana PAN : AAZPR4972K- Assessment year 2005-06. (iii) Owning of one residential house on the date of transfer. Thus the assessee has met with all the requirements provided under section 54F and claimed deduction under section 54F. There is noth­ing in the section which bars the assessee to claim the deduction regarding exceeded investment of earlier year provided under section 54F regarding claiming of exemption are not applicable to the assessee. On a plain reading of section 54F it seems that the assessee is enti­tled to claim exemption on full investments again as the assessee has met with all the requirements provided under section 54F but it can never be the intention of the legislation so the assessee claimed deduction only on the exceeded investments. Thus the deduction claimed in the return is correct on facts and law and the assessment order allowing deduction is correct. The assessing officer had taken all the details of assessment year 2004-05 which has been placed on file so the assessing officer rightly interpreted the provisions of section 54F and allowed the exemption. So the judgment of the Income Tax Appellate Tribunal Mumbai Bench (2007) 162 Taxman 39 (Mag) is applicable to this case. The judgment of the Punjab and Haryana High Court in CIT v. Vinod Kumar Gupta (2007) 165 Taxman 225 (P&H) decided on 28-2-2007, is also relevant in which the assessing officer while framing the assessment treated a receipt, to be a capital receipt. The Hon’ble High Court held merely because there was a second opinion possible on the same facts. The Commissioner could not, in those circumstances, exercise the powers under section 263. Thus the provisions of section 263(1) should not be invoked. 7. The learned counsel for the assessee thereafter drew our attention to the notice issued in the second round which is reproduced in the earlier part of our order. The learned counsel for the assessee pointed out from the above documents that the order of the assessing officer had been subject to review earlier also on the identical issue and after being convinced and satisfied with the reply of the assessee the proceeding had been dropped. The learned counsel for the assessee, therefore, stated that the review proceedings again could not be initiated on the same issue. In support of its contention the learned counsel for the assessee relied on the order of the Income Tax Appellate Tribunal, Delhi Bench in the case of Satya Prakash Gupta v. ITO (I.T.A. No. 2730/Delhi/2013) wherein the learned counsel for the assessee pointed out, that it was categorically held in iden­tical set of circumstances that the second round of revisionary proceedings were illegal and the order passed under section 263 of the Act was not sustainable. 8. The learned Departmental Representative at this juncture stated that there must be no bar in reviewing an assessment order twice on the iden­tical issue even when the earlier proceedings have been dropped. The argument of the learned Departmental Representative was that by placing such a bar there may be a possibility of an error being perpetuated, which may have occurred by virtue of dropping of the earlier proceeding. The learned Departmental Representative placed reliance on the order of the Hon’ble apex court in the case of Distributors (Baroda) (P) Ltd. v. Union of India (1985) 155 ITR 120 (SC). 9. We have heard the contentions of both the parties and perused the orders of the authorities below. The issue and the error as per the learned Commissioner which had occurred in the order of the assessing officer which required initiation of review proceedings in the present case was that the assessee had wrongly claimed and been allowed deduction under section 54F of the Act from the long-term capital gain earned by it on account of construction of house undertaken by it to the extent of Rs. 15,06,457. The reasoning being that the deduction on account of purchase of land and construction undertaken on the said land, under sections 54 and 54F, had been claimed and been allowed to the assessee in the preceding assessment year, i.e., assessment year 2004-05. The contention of the Revenue is that once the deduction under sections 54 and 54F of the Act has been claimed on account of house constructed against capital gains earned during the year, any surplus remaining there­from cannot be carried over to the next year and claimed as deduction from capital gain earned in the succeeding year. 10. Clearly and undisputedly this issue was examined by the Commissioner in proceeding initiated under section 263 of the Act vide his notice dated 14-12-2007 and due reply filed by the assessee, after considering which and after being satisfied by which the proceedings were dropped. The present proceeding having been initiated on the identical issue are clearly unsustainable in law since it simply tantamounts to review of the order of the Commissioner and not of the assessing officer. 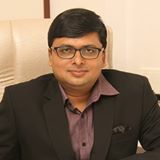 The co-ordinate Bench of the Income Tax Appellate Tribunal in the case of Satya Prakash Gupta (supra) has in identical circumstances held that the successor Commissioner becomes functus officio in this regard after the exercise conducted by the predecessor Commissioner. Therefore, we have no hesitation in holding that the order passed under section 263 is not sustainable on this ground alone. 11. As far as the argument of the learned Departmental Representative that such a finding would lead to perpetuation of an error, the learned Departmental Representative was asked at the Bar to demonstrate in the present case as to what error would be perpetuated. To this, the learned Departmental Representative responded by saying that the claim of deduction under section 54F by the assessee was in contravention of the provisions of law and by setting aside the order of the Commissioner for the reason that the issue had already been examined by the earlier Commissioner, the error of allowing deduction to the asses­see under section 54F of the Act would continue to be perpetuated. 12. We find no merit in this contention of the learned Departmental Representative. The explanation given by the assessee in this regard vide its reply submitted to the Commissioner in the earlier proceed­ing and even in the present proceeding, we find is plausible and reason­able. A bare reading of sections 54 and 54F of the Act nowhere states that the surplus remaining after claiming deduction under section 54/54F on account of construction of house property undertaken in a year, would not be allowed set off against long-term capital gain earned in the succeeding year. There is no such specific bar provided in the section. The learned Departmental Representative also agreed to this. Therefore, as long as the conditions specified under section 54F are fulfilled, the interpretation and understanding of section as taken by the assessee and also by the earlier Commissioner cannot be said to be perverse and grossly against law. Therefore, the argument of the learned Departmental Representative that an error would be allowed to be perpetuated by setting aside the present order of the learned Commissioner on technical grounds, we find has no merit. 13. In view of the above we allow the appeal of the assessee and set aside the order passed by the learned Commissioner under section 263 of the Act. The addition made of Rs. 15,06,457 is, therefore, directed to be deleted. 14. The appeal of the assessee in I.T.A. No. 667/Chd/2010 is allowed. 15. The present appeal relates to the levy of penalty on the addition made of Rs. 15,06,457 by denying deduction under section 54F of the Act against the long-term capital gains earned by the assessee. Since the impugned addition has been deleted by us in our order passed in I.T.A. No. 667/ Chd/2010, there remains no basis for levy of penalty under section 271(l)(c) of the Act and penalty levied, therefore, amounting to Rs. 3,38,050 is also deleted. 16. The appeal of the assessee in I.T.A. No. 954/Chd/2016 is allowed. 17. In the result, both the appeals of the assessee are allowed. 18. The order pronounced in the open court.